E. G. Hill spent a lifetime with roses and is often thought of as the "Dean of American Rose Growers". He was born during the days of the Civil War and spent his last sixty-three years here in Richmond, Indiana. The Richmond community mourned his death in 1933 and turned to the Garden Club Board to decide how to mark the life of this great man. They began planning a memorial that would be symbolic of his years of dedication to the City and to roses. A site was chosen east of the main entrance to the beautiful Glen Miller Park, which was very appropriate since Mr. Hill had served as President of the park Commission in 1894. Indiana sculptor, Jon Magnus Jonson designed and executed a simple but massive limestone fountain. A beautiful garden with roses and evergreens was planted around the fountain and in 1937 the E. Gurney Hill Memorial Fountain and Garden were opened to the public. In the summer of 2000, renovation of the fountain took place with a new top bowl and period figurine being added. 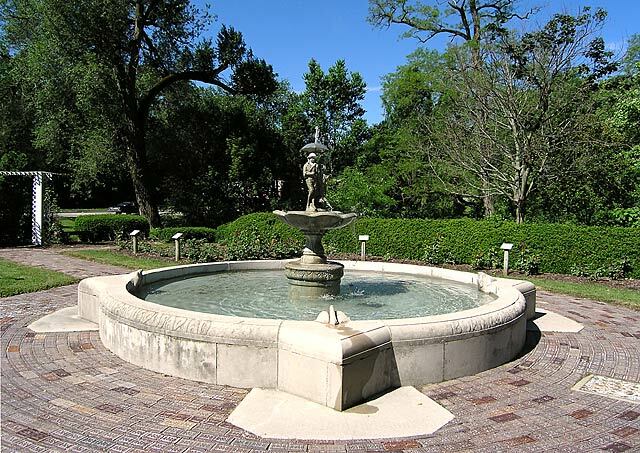 Special care was taken in choosing pieces that would compliment the age of the fountain. The E. G. Hill Memorial Garden still receives many visitors each year and many couples select this spot to have their weddings. Over 350 rose bushes grace this garden with 17 varieties of roses. Historic star bricks line the pathways throughout the garden and sections are labeled with a short description of the rose growing in that area.